The creation is inspired by the graphic novel Maus, by Art Spiegelman, “a model reference in Arts as a way to take back the historical and collective memory”, according to the artist. The proposal results from a mix of iconic, artistic, documentary and evocative elements of the multiplicity of the victims of genocide, with the will of transferring the memory of Holocaust to the new generations. The project is led by Jordi Guixé, director of EUROM, and commissioned by Núria Ricart, a lecturer at the Faculty of Fine Arts of the University of Barcelona. 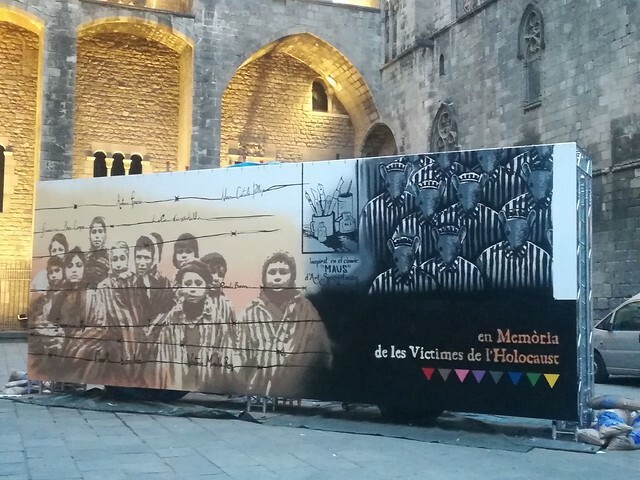 EUROM’s proposals for the International Holocaust Remembrance Day in Barcelona focus on the shared responsibility and importance of education on genocide to promote the refusal to all ways of discrimination, violence, and anti-Semitism. The activities are part of the program promoted by the Commissioner of Memory Programmes of Barcelona’s City Council in collaboration with the Museu d’Historia de Barcelona (History Museum, MUHBA).